Discussion in '"Boat Anchor" & Classic Equipment' started by N4ZAW, Nov 7, 2018. I don't smoke, but.. I turned on my "baby", a gorgeous FT101E, as I normally do once a month or so, to keep the caps and tubes from getting 'stove-up' --- kinda like I do when I sit too long. I was sitting here in the shack when I noticed the unmistakable smell of plastic insulation burning, and sniffed it down to the old 101. I was hoping someone with experience, can tell me where "C11" and "C8" even are? I'm having a bit of difficulty troubleshooting this old girl, as the off-PCB components aren't shown in the service manual (you know, like SAMs books used to show?). So everything has to be traced-out by "dissection". I'm reluctant to grab a scalpel and start hacking, though I'll NEVER get rid of it, or give up on it. Trust me, this beauty is worth respect -- even if she IS in 'intensive care' right now. Personally, I've never known C109 (or any of the other electrolytics) fail in these rigs . . . But it could be that the PA compartment has been allowed to get way too hot - EITHER because the Fan isn't running at full speed (needs servicing every few years, very easy) . . . OR maybe the rig has been used on AM, running more than 100mA PA Current. And of course, electrolytics don't like getting too hot! If C109 has gone partial short-circuit, that would explain why R40 has burnt out - as I recall it's the long brown resistor in the small area between the Driver Base and the PA Valves. No reason why this would have damaged your 12BY7A. Yaesu always fitted Toshiba valves . . . but I doubt if the brand of 12BY7A is at all critical. R40 is the white, long, square 1.5 K, 5 watt ceramic resistor to the plate of the 12BY7 as I recall. Mine failed for no apparent reason but it went open circuit. A local surplus store had the exact same resistor. Replaced it and no other problems. Unfortunately, that surplus store will be going out of business in December. I think they charged me about $0.45 for that resistor and it was new. They don't use any white square ceramic resistors ! That must have been a replacemet fitted by someone . . .
Now that I think about it, it was the only white ceramic power resistor. The others were the brown color as in your photo. That means R40 failed at least twice! Thank you for the help and thread link. I don't think this one has seen much in the way of AM mode, but can only speak for the last ten years of it's history. C109 was obviously changed out at some point before I got it because it's radial not axial. So far, I've found no other issues, so I'm banking on this 2.2uF@450VDC cap to be the cause of R40's demise. As for R40, I'm sure a ceramic would work fine, though my original is a brown wire-wound 5W Flameproof (see pic). The red-wire going nowhere is where I snipped the lead of R40, which leads had red heatshrink insulation on them. I found exact replacement at "Westflorida Components" out of Tarpon Springs.. I never heard of them before, ordered the components through ebay, where they have a store which is so close to where I live, that I could drive there in less than an hour! But I guess it's a warehouse operation and online only. Should have the parts as early as tomorrow. I should have a chance to install the new parts and post an update before Monday if so. I'm going to remove everything from the two feed-through caps in the bulkhead to check them before installing the new components.. I just realized that the 2.2 uF, 450 VDC capacitor was missing from my unit. You could see where someone snipped it out and left leads. It may have been the same failure that took out the original 1.5K, 5 watt resistor. I have always presumed R40 is there just as a safety resistor, mainly because it's very easy to short the Driver/Grid Trimmers to chassis when adjusting them with a metal screwdriver . . . as it is, you just get a flash, but don't do any damage. Without R40 you would damage the PSU, probably blow the rectifiers . . . or even worse, burn out the Tuned inductors due to excessive current. The 2.2uF electrolytic is just there to provide de-coupling after that resistor. It's strange that you have BOTH had that resistor burn out . . . I have never known that fail on these rigs! But as I said before, if the electrolytic got too hot, it would start shorting, and take out R40. Those trimmers LOOK ok, but Roger, your description reminds me to make sure they are before firing the rig back up. I never did like those mini trimmers, and for that very reason (way underrated for the RF they normally handle) and they liked to 'arc-over' during adjustment. I learned to never try to adjust them with RF present. Back in my CB days in the 70's, they took out more MRF454's than I could afford, until I learned to "tweak" them a bit when idle, remove the tool, then transmit and check. Usually, all would be fine. But you're so right --- Very touchy components. By the way, c110 (1000pf 'feed-thru' cap) checked ok with an ohmmeter, but the dielectric looks 'melted' and warped. I'll replace that too, just to be sure it's not 'flashing-over' under load, since I have some of those in my junk. They probably just used those to get the circuit safely through that bulkhead anyhow. In my case, I am only speculating that a bad C109 ( 2.2 mfd, 450 VDC ) went bad and took out R40. It was already missing when I bought the 101 and R40 had been replaced with a white, ceramic resistor instead of the brown wirewound. At the time I found the cut leads and discovered that C109 had once been there, I did wonder why anyone would decide to remove it. 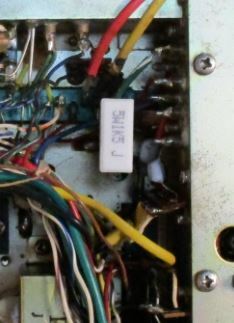 It was in the same area that I discovered another capacitor had been soldered back but not between the proper points. Here is R40 in my 101.